There are a wide variety of chairs, benches & sofas to choose from. Picking the right one for your outdoor space sets the tone for your garden. Pick from single chairs, a classic bench or sofas to match the comfort of your indoor upholstery. They may just be for 1 person to sit and relax or dine on, but outdoor chairs come in different materials, shapes and designs. Chairs are often part of a set or can mix and match for the perfect combination, however some can be used as standalone pieces. Wood and wicker chairs are often bigger, taking up more space. However, they also have a variety of uses, offering places to both lounge or dine. Our range of textile sling chairs include the multi-positioning chair, with an arm adjustment feature to offer a best position for you. Mesh chairs often come pre-assembled but are limited to just dining rather than lounging. Tailored cushions offer added comfort on mesh furniture and come in a range of colours to match the surroundings. Our wicker chairs come with luxurious, foam core cushions while textile sling needs no cushions with its springy feel. Benches can be an intimate, cosy place to snuggle in a corner of your garden. Think about where you want the bench in your garden. Is there a peaceful nook where you can set up your bench? How about next to some french doors, on a patio area with a view of the whole garden? Mesh and wooden benches give a garden such a romantic feel and are perfect for sitting with a loved one and enjoying your outdoor space. They offer ideal spots to find a blissful moment which turns into a memory to last a lifetime. If you have a family who like to enjoy time together outdoors, sofas are the perfect way to get everyone outside. 3 seater and 2 seater sofas can mix and match with single chairs as well as coffee tables or dining tables to create a lounge set. Take the comfort of the indoors outside with cosy seat cushions to let you sink into the sofa. With both wicker and wood, bucket shaped and classic sofa designs, you can pick the right sofa for your space. Whether you need comfort on a patio, decking area, or a conservatory, sofas always bring a relaxing vibe to any garden. There are plenty of ways you and a loved one can snuggle up outside. Daybeds or Pods offer a perfect way to relax after a long day. Not just garden furniture, these are statement pieces, grabbing the attention of all who enter your garden. Twin Seats or Companion Sets are ideal for afternoon tea, with 2 chairs separated by a small table. Often the tables can accommodate a parasol for added cover when outdoors. KETTLER seating is durable, weatherproof and built to last, however we advise storing them away over wet and winter months, to make them last longer. Cushions in particular should be taken inside overnight and during the wetter months. Unlike tables, chairs are often moved – tucked in, pulled out, adjusted to make room for more chairs. Think about where you are putting the chairs and how hard the ground is. Although KETTLER chairs often come with foot protectors, try to lift the chairs where possible, instead of sliding. 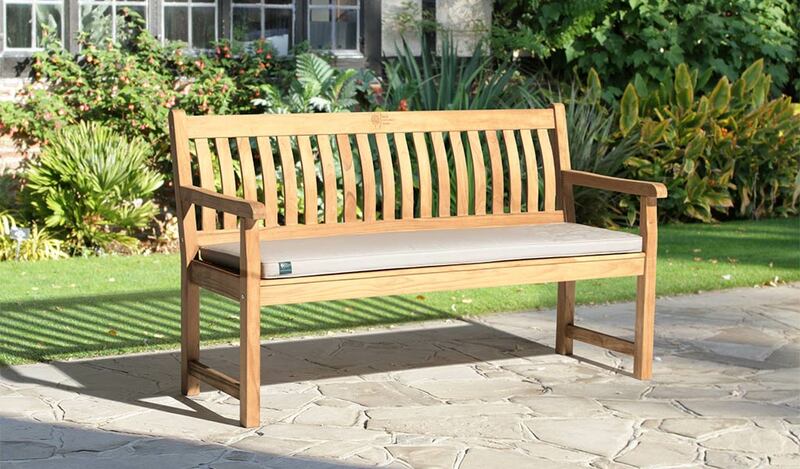 Click for more information and advice on caring for your garden furniture. Wicker and wood chairs include cushions or back pads for comfort while most mesh chairs have a tailored cushion available in a choice of colours. That being said, feel free to add extra cushions or a throw, making sure you maintain the look of your garden furniture and your garden. Footstools are a great accessory to push the boundaries of your relaxation. A chair can feel comfy to sit on, but add a footstool and you may find your heaven. As the old saying goes, you get what you pay for. KETTLER garden furniture comes in so many varieties, from benches to sofas, fixed backs to cushioned backs, square arms to bucket arms. All our furniture include a quality like no other, coming from our extensive attention to detail. 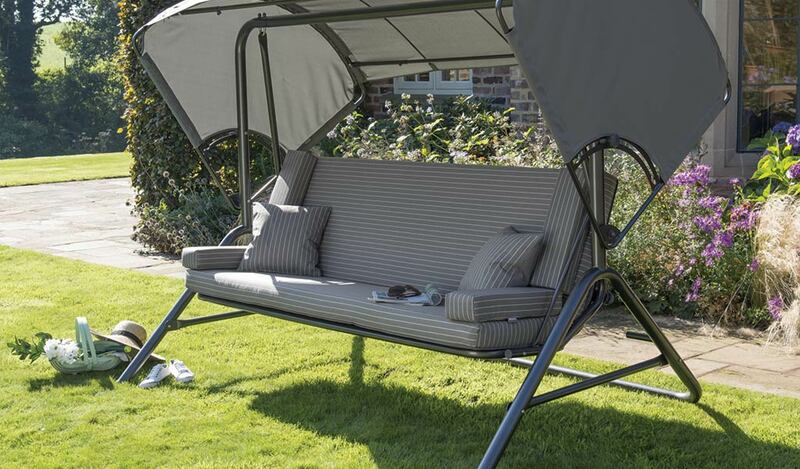 Our luxurious foam core cushions feel like little clouds while the handwoven wicker wraps around durable, rustproof and lightweight aluminium frames. 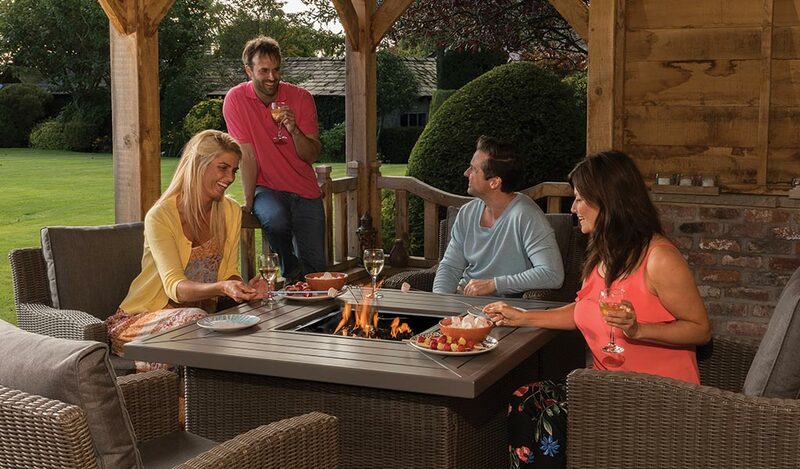 Furniture needs to be for all occasions, and our garden furniture lets you relax or dine in style and comfort. 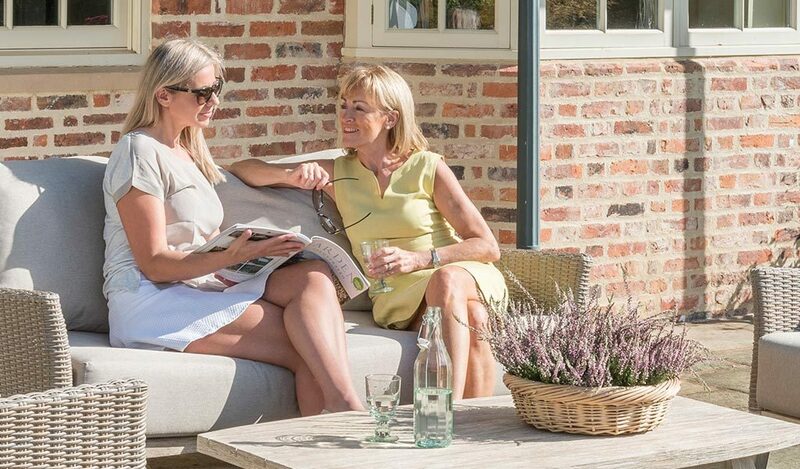 You will impress friends, neighbours or family, filling the garden with life and luxury with KETTLER’s chairs, benches & sofas.